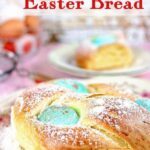 This easy Italian Easter bread recipe is a traditional part of Italian and Greek Easter celebrations when family and friends gather to share the holiday meal. My version is slightly sweet with a little lime zest to wake up the flavor. This is a glorious way to begin Easter Sunday — or Fourth of July for that matter. 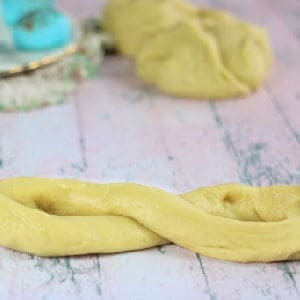 Lightly sweetened, rich, buttery yeast dough is flavored with vanilla and lime, then braided, and baked. Once out of the oven you can either glaze it with a Confectioner’s glaze or just dust with Confectioner’s sugar as I have here. I used bread flour in my recipe which creates a more dense, bread-like texture. If you want a softer, cakier texture use all-purpose flour. 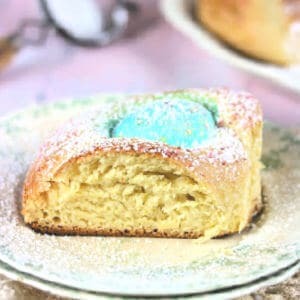 I’m not sure what else to say — Italian Easter Bread is as beautiful as it is delicious. And I love carrying on delicious traditions! We weren’t really a church-going family but we usually went on Easter. Back in the 60s it wasn’t just a matter of throwing on some clothes and going, either. For a tomboy like me (because despite the hours my mom took creating a head full of Shirley Temple style finger curls I was a tomboy to my core) it was hell. Once dressed we drove to attend service at a very, very, very old church that smelled like polished wood and old lady perfume. It was a five day drive and my dad did not believe in bathroom breaks. OK. A 20 minute drive that seemed like forever. What does this have to do with my gorgeous Easter Bread? Not a thing. I am pretty sure I had Cap’n Crunch and a white chocolate bunny for breakfast most Easters. My mom was not a woman that enjoyed cooking. She was, however, an avid nature lover and she painstakingly looked for and found robins’ nests so that I could peek at the eggs. Time needed: 2 hours and 40 minutes. 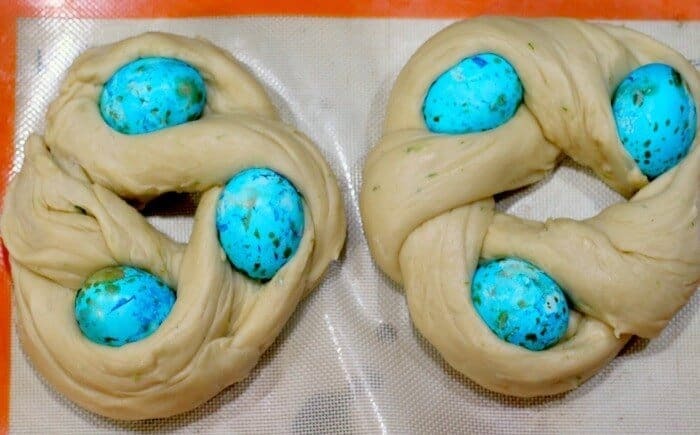 Here are the steps to dying the eggs with Kool Aid, speckling them, and creating the Italian Easter Egg Bread wreath. Use raw, white eggs – they cook in the oven. Pour one envelope of Kool Aid into a 10 ounce container and add 2/3 cup water. Stir to dissolve the Kool Aid. 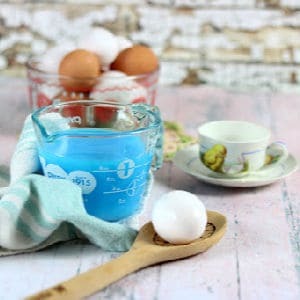 Add a raw egg carefully and keep it under the “dye” until it is the color you want. Remove it and let it dry. Dilute brown gel food color with a little water. 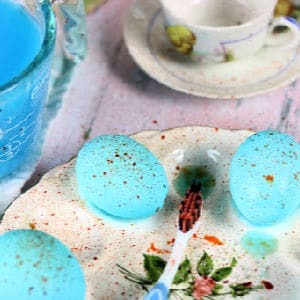 Dip a toothbrush in and then, with the brush pointed at the egg, run your thumb down the bristles to splatter the color. It does take a little practice. Let the eggs dry completely before using. After the first rise cut the dough into 4 equal pieces. Roll each piece into a 14 inch long rope. Place two ropes parallel to each other and pinch the ends together. Bring one rope over the other. Repeat until you get to the end. It’s actually more of a twist than a braid. This is a pretty simple sweet bread to make but here are a few tips I’ve found helpful. Be sure to use raw eggs – they’ll cook in the oven. Test the water anytime you use yeast – it should be right around 110F. Make sure ALL your ingredients are at room temperature or slightly warm to the touch. You can put this together the night before and let it rise overnight in the refrigerator. If you do plan to let it rise in the refrigerator add about 1/8 teaspoon extra yeast. 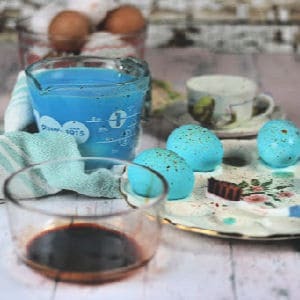 Use organic eggs for richer color. The yolks in the eggs I used were very deep yellow so the bread has a rich look to it that I like. If your eggs have light yolks you can add a few drops of yellow food coloring to give the bread the same color. You can make this bread into individually sized rolls with one egg in the center or each. While the bread will freeze beautifully the eggs will not. Remove them if you plan to freeze the bread. 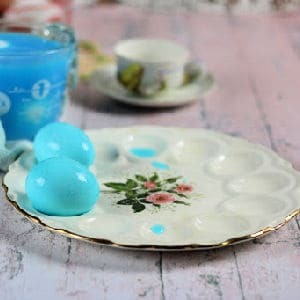 I dyed these eggs with the blue Kool Aid and then used a toothbrush to “speckle” the eggs with diluted brown food coloring gel. It was fun and I really liked how they came out! This is an easy bread to make – especially if you’ll be kneading by machine. My favorite mixer for bread baking is my Bosch Universal. It’s what I use for all my yeast breads. 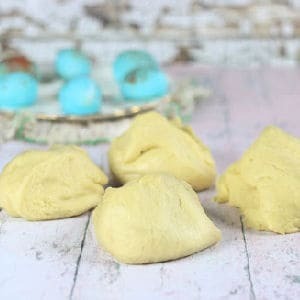 Easter Bunny Sweet Rolls – Cute, orange sweet rolls shaped like bunnies and glazed with a sticky glaze will make the kids’ eyes sparkle! They’re so cute! Easter Dessert Ideas – If you’re not sure what you want you definitely need to check this out. Over 60 possibilities – you’ll definitely find something here! Chocolate Babka – Buttery, flaky dough is swirled with chocolate. Coconut Cake – This classic Southern coconut layer cake is SO good with raspberry filling! Coconut Pie – This coconut pie is so unique! It’s like a pecan pie only with coconut. 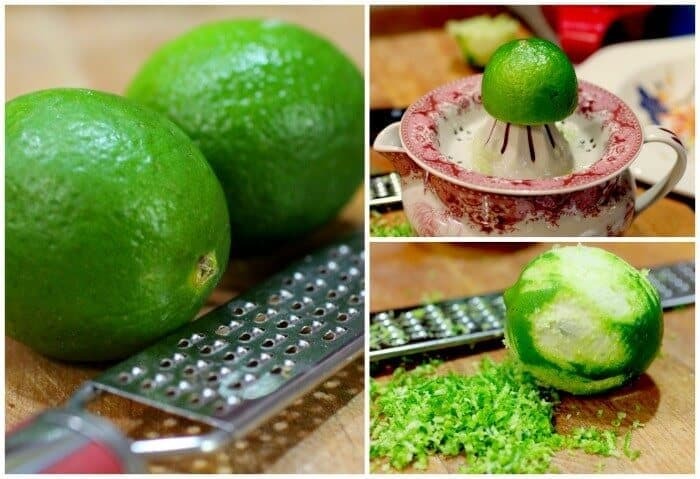 Lime Zest – the finely grated rind (green outer skin) of the lime. Doubled (yeast doughs) – The dough is doubled when you can poke your finger in it to the first knuckle and it doesn’t fill in. It will actually double in size. Deflate the Dough – Do this by gently pressing the dough down until it is flattened. 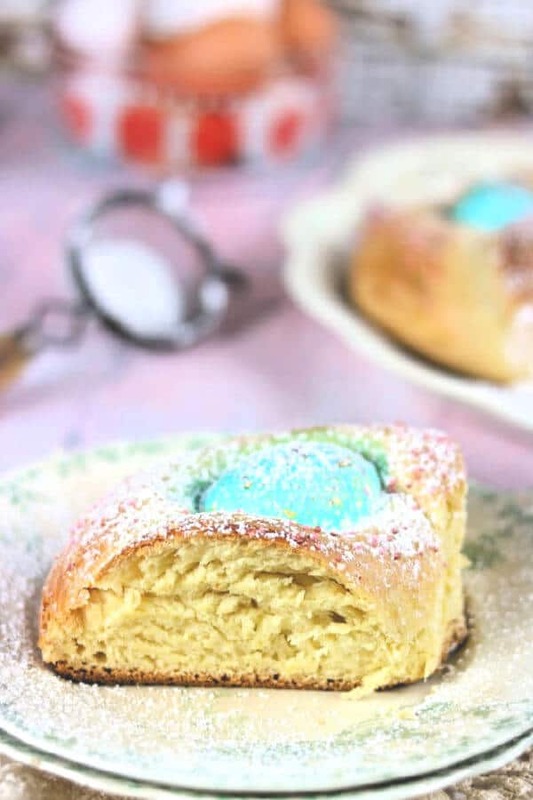 This buttery Italian Easter Bread is so pretty! It makes a great centerpiece for Easter. If you are new to bread making you’ll want to take a look at the Beginner’s Guide to Homemade Bread Making before you get started. 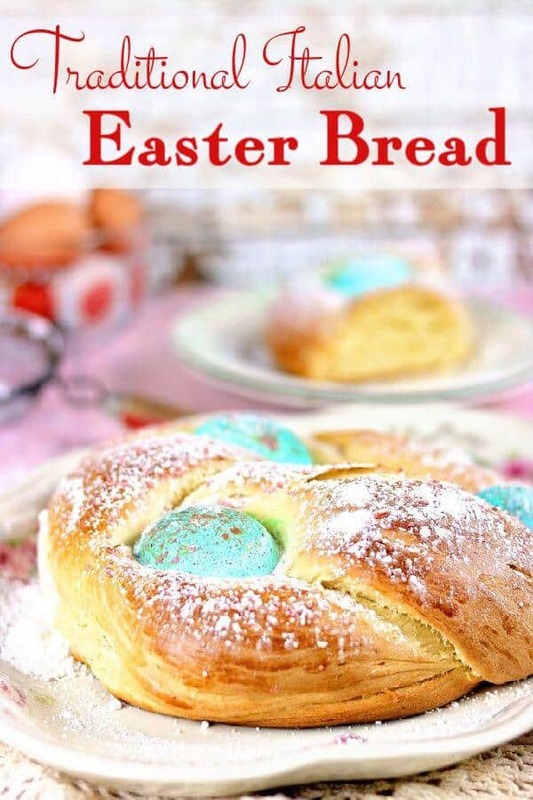 A beautiful Easter Egg bread is the perfect centerpiece to any spring brunch. 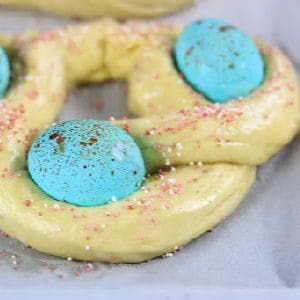 This slightly sweetened, lime and vanilla braid has colored eggs baked in it. You can also let it rise overnight in the refrigerator and bake it in the morning. Dye 6 raw eggs and set aside to dry. Mix yeast, 2 tablespoons of sugar, and 1 ½ cups flour until smooth. Set aside until doubled, about 1 hour. Cream the butter, 1 cup of sugar, and salt together in a bowl. Stir in the lime zest, juice, and vanilla. Add 3 of the eggs, one at a time, mixing well after each addition. Stir in the yeast mixture and add the remaining flour until a smooth dough forms and pulls away from the bowl. Knead for 5 minutes by machine or 10 minutes by hand. Oil the dough and place it in a greased bowl. Cover and let rise about 1 hour, or until double. Deflate the dough gently and cut into 4 pieces. Roll each piece into a rope about 18 inches long. Lay 2 ropes next to each other. Loosely braid them together, making sure you can separate the strands to put the 3 of the dyed (raw) eggs in. Seal the ends together to make a ring. Separate the ropes to fit the eggs into the braid. Repeat with the other two ropes, adding the remaining dyed eggs. Bake the loaves in a preheated oven for 10 minutes. Beat the egg yolk and cream. Remove the bread from the oven. Brush the egg yolk mixture on to the Easter Bread. Return to the oven and continue to bake until the loaves sound hollow when tapped, about 30 to 40 minutes. I used bread flour in my recipe which creates a more dense, breadlike texture. If you want a softer texture use all purpose flour. 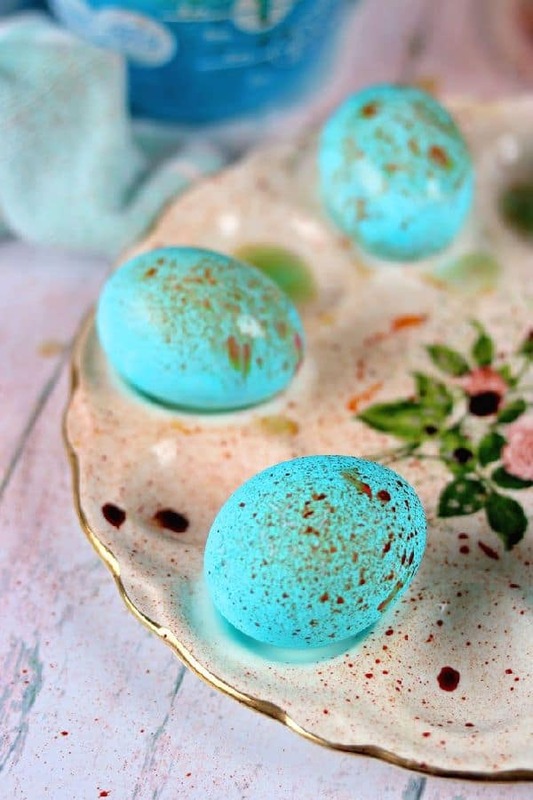 Leave the 6 dyed eggs for the decoration raw – they’ll cook in the oven. Hi my name is Cathy Sinisi, I used to make an Easter Bread, for Easter. Called Embena! It seams like alot to do. But when you make ad often as I have it DOESN’T steam like it. It’s been handed down through the years. It’s smells so GOOD. Thanks Marya! 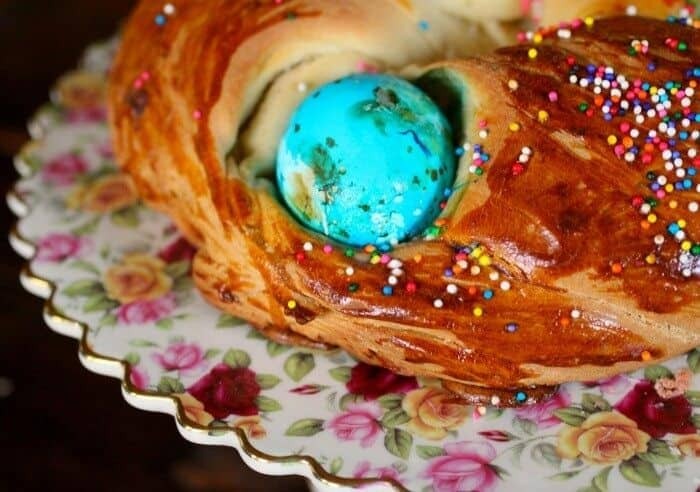 I immediately fall in love with your gorgeous Easter Egg Bread. A perfect Easter gift idea for our loved ones! Thank you! It’s so beautiful as an edible centerpiece as well. Thanks for stopping by. So appropriate for the upcoming Easter festivities! I put you on my Feedly from the theme reveal. Enjoying your posts.